The Kojosho System believes that proper training should encompass both physical and spiritual disciplines. And the separation of Karate into physical and spiritual levels is a misunderstanding of the nature of Karate. Karate is a martial art. Circumstances, and not individual taste, determine its outward appearance. Referring to Karate as a martial art shows the inseparable bond between martial application and artistic expression. 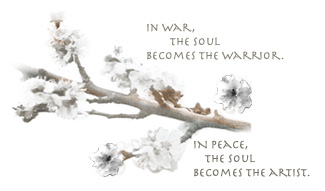 In war, the soul must become the warrior. In peace, the soul becomes the artist. The Kojosho System goals are the goals of the traditional martial arts. Lessons we learn can be applied to every area of our lives. Karate is an efficient fighting art, and the self-defense benefits of Karate instruction are obvious. But how often are we called upon to use this knowledge? Luckily, most of us are secure in our lives, and the odds are very good in this day and time that we will never have to fight for our lives. Why, then, do we continue to study Karate? There are health benefits to continued study. And by mastering ourselves in our training, we can learn to master other aspects of our lives. Personal, financial, or professional success is not beyond the capabilities of the Black Belt. Those are benefits that can be seen and touched. But the unseen and intangible benefits of philosophical study nourish the warrior's spirit and are even more meaningful. Understanding aesthetics (what is beautiful), ethics (what is good), metaphysics (what is being), and epistemology (what is knowledge) can provide the Karate student the ability to discern what is true and beautiful and can deliver the wisdom and the strength to know what is just and what is right. The Kojosho System considers everyone a student. Although every martial art must have teachers, in the Kojosho System, even teachers are students. Two philosophical statements are made by this emphasis on the word "student." The first is a conscious exhibition of the virtue of humility. The Kojosho System has no living masters. We acknowledge certain men as masters whose importance to the Kojosho System demands the use of that word. We consider those men to be giants. Their legacies serve as inspirations to every student because they dedicated their lives to the advancement of the System. We celebrate their contributions, and accept the status of students in deference to these men. Good manners demand this ceremonial bow. To do otherwise would be unthinkable. The second philosophical statement lies in the implications of the words "master" and "student." From all indications, life does not accept stasis. Clearly, all things are either growing or decaying, and that which does not advance must inevitably decline. Instead of being, the student is in a state of becoming. Only under this condition is the student actively attempting to reach his or her goals and continuing to evolve. Although "master" is a traditional title, when the term "master" implies perfection, there is no more need for change or for evolutionary growth. The goal of the Kojosho System is to guide martial artists in their growth as strong individuals. Achievement of this goal requires physical, mental, and spiritual growth. The Kojosho System views the black belt as a stepping stone in the development of the martial artist, not as an end result. A process of growth is required, becoming instead of being. Thus, the System must be able to set genuine goals for the sixty year student as well as for the first year student. A system's true test is whether the advanced martial artist can find expression and satisfaction without confinement. Total development of the martial artist requires physical, mental, and spiritual goals. The physical challenge is the development of effective and efficient motion. The mental requirement is that the student fully understands the concepts of motion within the Forms and is then able to communicate his or her discoveries. The spiritual goal is the cultivation of virtuous behavior in each individual because spiritual development is the key to the inner power. The traditional Chinese martial arts school views instructors as parents and students as children. Students come to the instructor as infants. They are ignorant of proper behavior and cannot even know the depth of their ignorance. It is the duty of the instructor to nurture and teach these infants by lecture and example. As students mature, they are each given additional responsibilities - alternately praised and scolded, pulled and pushed, and above all, shown the ideals of proper behavior. Traditionally, the instructor gives every promising Kojosho student an unusual gift. On some momentous day, an insignificant stone is picked off the ground and formally presented to the eager student. This stone becomes a pearl of great price. Nothing has intrinsic value. The worth of any object is determined not by its essential nature, but by the price a person is willing to pay. A diamond can have utilitarian value as a cutting tool and aesthetic value as a gemstone, but its value is measured by the price it commands in the marketplace. An object is given worth by the person who possesses it because that person lends value to the object. Technical expertise in Karate cannot be bought with money. Its price is years of effort, countless attempts, innumerable failures, and finally some measure of success. The value the student places on his or her training is readily apparent to all, and the superior student cherishes all martial arts, all instructors, all students, and thereby enriches him or herself. The warrior who owns a priceless sword does not place it in the hands of a child. Ignorant of its worth, the child will not value that treasure or treat it with responsibility or respect. To a child, a sword is just another toy, and in play, without a care, that child will drag even the most precious sword through the mud. To most people, Kojosho training is as worthless as any stone on the ground, unknown and unimportant. It is the responsibility of the instructor to show his students the respect he has for his art and to teach them to treat it with reverence. The most insignificant stone, when presented by an instructor, gains in value when guarded and cherished. The student who makes the commitment lends to Kojosho the value of personal devotion.